Apartment MIRÓ-BILE: a taste of art, southward balcony, in the city centre West (Charlottenburg) – near to the green riverside of the river Spree. Modern, sunny and a taste of art. A small bedroom and a big living room give access to the southward balcony. From there you can look to the well-kept front garden. The couch is extendable, so four people find sleeping places in this flat. Next door lefthand, you can get breakfast in a likable coffee shop or buy bakery products and drinks. Supermarkets are within walking distance: "Reichelt" - 6 min, "Lidl" and "Rewe" - 10 min. I want especially recommend you the biergarden “Die Schnitzelei” with excellent German-Austrian cuisine, remarkable furnishings, and a friendly service. Situated directly by the river- from the apartment to the right and next street also to the right. (200 m). "Good location, fairly near U-Bahn Stations Richard Wagner Platz and Deutsche Oper, also the River Spree is nearby. No information was giwen where to get WiFi name and password, how to use blinds (the clock for automatic operation show winter time!). The hallway door is paper thin and won´t keep the noise out, some of the kitchen amenities are rather useless. The balcony is big and nice but you are sitting there like on a stage, visible to everyone on the street or on the courtyard." Die Wohnung liegt zentral und doch sehr ruhig. Ein Parkplatz auf dem Grundstück gehörte ebenfalls dazu. Das Bett und das Badezimmer haben uns sehr gut gefallen. 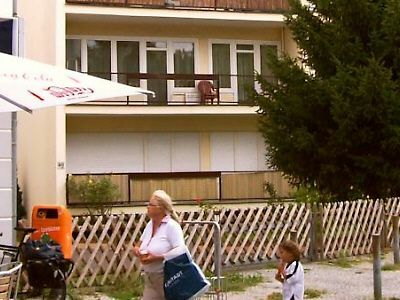 Der Rest der Wohnung war absolut urlaubstauglich. Der Kontakt zum Vermieter und die Schlüsselübergabe könnten nicht besser sein! Wir werden diese Wohnung bei unserem nächsten Berlinbesuch wieder mieten!!!! Lieben Dank für die nette Bewertung. Es läßt das Herz eines Gastgebers höher schlagen, wenn der Gast sich richtig wohlfühlt. Wir haben uns in der Wohnung sehr wohl gefühlt. Sie hatte alles was man so braucht. Der Kontakt zum Vermieter war problemlos und hilfreich. Nous avons beaucoup appréciez notre séjour à Berlin dans l'appartement Mirobile. Tout était très propre et joliment décoré. Rien ne manquait à notre confort. Les conseils de Dieter ont été très utiles et je le remercie pour sa souplesse sur les horaires d'arrivées et de départ. L'appartement est un peu loin de l'hypercentre,mais Berlin est une ville très étendue et on y gagne un quartier tranquille. On peu quand même aller dans de bons restaurant dans Charlottenburg et rentrer à pieds les soirs d'été. On vous conseille de louer des vélos plus simple et plus rapide que le métro." Public transport in Berlin is excellent. So you can easily discover all points of interest from the apartment by bus 101 which stops 150 m from the house or by underground (station “Richard-Wagner-Platz”, 500 m). Taking the bus to the south you will be within 10 min. at Kurfürstendamm. Or getting of at Kantstrasse after 3 min. and taking bus M49 you will be within further 6 min. at international Congress Center or at the fairgrounds. To the north you take the bus 101 to change at “U-Tiergarten” into bus TXL to make the tour to Hauptbahnhof (6 min), Brandenburger Gate (15 min or Alexanderplatz (19 min). Taking the underground you can get of after 2 stops to get the S-Bahn at Station Charlottenburg (“BHF Charlottenburg”, 5 min.) I recommend you this city train for longer distances as e.g. Olympic stade (10 min), airport Schönefeld (40 min) or Potsdam (40 min) – the capital of Brandenburg with the famous Potsdam Sanssouci castle. Anreise generell ab 16 Uhr - eventuell früher, dies muss aber schriftlich vereinbart sein Abreise spätestens um 11 Uhr. Der Gast teilt dem Vermieter spätestens 2 Wochen vor Anreise die ungefähre Ankunftszeit mit, damit dieser die Schlüsselübergabe organisieren kann.